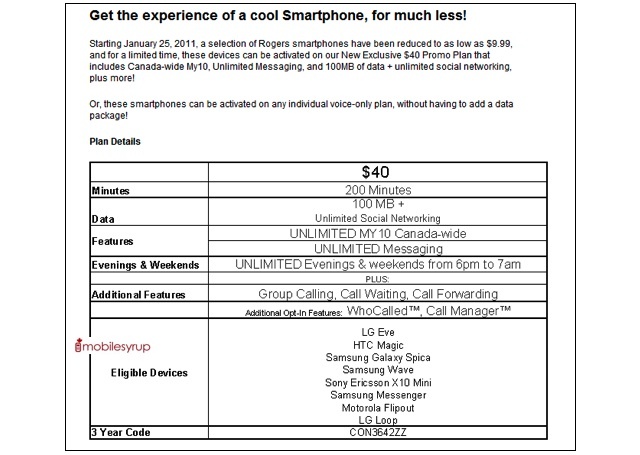 Rogers discounts select Smartphones... offers up "New Exclusive $40 Promo Plan"
Looking to get any of these Rogers devices: LG Eve, HTC Magic+, Samsung Galaxy Spica, Samsung Wave, Sony Ericsson X10 mini, Samsung Messenger, Motorola Flipout or the LG Loop? If so Rogers has come up with a “New Exclusive $40 Promo Plan”. A 3-year contract must be signed and here are the details: 200 minutes/month, 100MB data plus Unlimited Social Networking (Facebook, Twitter, MySpace, Bebo, Flickr, Photobucket or LinkedIn), Unlimited My10 Canada-wide, Unlimited Messaging, Unlimited Evening & Weekends (6pm – 7am) plus group calling, call waiting and call forwarding. This is available for a limited time and has no clear end date.